DoubleSafety is an easy to use program for automatic data backup. 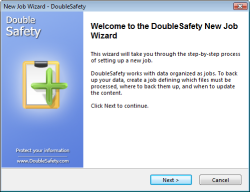 DoubleSafety 4.5 was available as a giveaway on June 10, 2010! 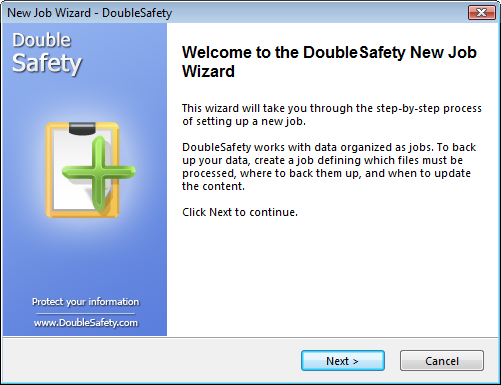 DoubleSafety is a program for automatic data backup. With an effortless user interface, you can store backups on your hard drive or use a local area network, send them to an FTP server or write to a CD/DVD or Blu-Ray/HD-DVD. You can also automatically encrypt data using the 256-bit AES algorithm. #41 You don't have to register the program. If you click on Help, then click on About, you will see that it is registered to "Give Away of the Day". I installed the program on my laptop Vista Ultimate 32 bit with no problems. I like the fact that you can backup system files, picture files, and files that other programs won't let you. You can also split the files to a small size before saving. I'm sure I'll find extra uses for this program than just your everyday HD backup. #41 You don't have to register the program. If you click on Help, then click on About, you will see that it is registered to "Give Away of the Day". I installed the program on my laptop Vista Ultimate 32 bit with no problems. I like the fact that you can backup system files, picture files, and files that other programs won't let you. You can also split the files to a small size before saving. I'm sure I'll find extra uses for this program than just your everyday HD backup. After the first back up of any folder (you can use a small one of your documents) you will find the programm registered. Check on: help -> about: "registered of giveawayoftheday". It worked on my laptop. Hope I could help, greetings from Germany. #41 Registration: I remembered the following of an earlier offer of that programm: After the first back up of any folder (you can use a small one of your documents) you will find the programm registered. Check on: help -&gt; about: "registered of giveawayoftheday". It worked on my laptop. Hope I could help, greetings from Germany. Install without any problem on WinXp. The scheduler do not register my choice. Not clear about " Save the forgotten Items"
Installed fine on Vista Home Basic and didn't need a reboot. It could not worked with gmail.com smtp settings. But most importantly it could not backup to an external hard drive. So I continue using Paragon Drive Copy which does a bang up job. lol #38. you may be getting a lot of thumbs down.. but i don't think the folks here understand the power/technical aspects (though it's so very simple) of what you said. the xcopy command will do all of this and more.. one batch file created with a couple command lines.. set it in your directory.. click it.. VOILA! everything copied to your harddrive elsewhere. it's also the fastest way to copy.. and no bloated software to launch every time! i applaud your genius.. as i've done this for years myself. i have to question the so called "programmers" above looking to software like this as a solution. they should better. I have been looking at different backup solutions recently because I cannot get Windows backup to run on a computer with 64-bit Windows 7. On my Windows XP machines I use a combination of different backup solutions (belt and braces approach), with Nero Backitup for daily backups of files and a couple of different programs for disk image backups. While this giveaway might not be a complete solution, maybe it could be used in combination with one of the many disk image backup programs in a "belt and braces" solution. To #31: you have confused backing-up with archiving. They are two different things. I have been looking at different backup solutions recently because I cannot get Windows backup to run on a computer with 64-bit Windows 7. On my Windows XP machines I use a combination of different backup solutions (belt and braces approach), with Nero Backitup for daily backups of files and a couple of different programs for disk image backups. While this giveaway might not be a complete solution, maybe it could be used in combination with one of the many disk image backup programs in a "belt and braces" solution. To #31: you have confused backing-up with archiving. They are two different things. Great app, use it since v4.2. Now v4.5 with even more features. Fine that the issue with the disturbing pop-up "end with error" is worked out. "Execute [ abc] command before the backup" and "Execute [ xyz] command after the backup". And... PLEASE let me store the options.ini and jobs in the program folder! and i don't like to think always about to go to AppData to copy the settings too. On this way you may want to store register-key in the program folder too, instead of under HKCU? Than i could just copy the whole DS install folder to the second pc. Great app, use it since v4.2. Now v4.5 with even more features. Fine that the issue with the disturbing pop-up "end with error" is worked out. If i may suggest an wish to the author: i miss a feature like "Execute [ abc] command before the backup" and "Execute [ xyz] command after the backup". I understand that i can run DoubleSafety with command-line commands and so could use an batch to do all i suggest on my own... But... ;-) - And... PLEASE let me store the options.ini and jobs in the program folder! PLEASE make it fully portable... i want to have my settings on different pc and i don't like to think always about to go to AppData to copy the settings too. On this way you may want to store register-key in the program folder too, instead of under HKCU? Than i could just copy the whole DS install folder to the second pc. Thank you. Thanks for this nice program! . When I read here earlier that DS doesn't use a proprietary backup file format but regular ZIPs my interest grew and I decided to install it. It reminds me of SecondCopy I've used before. That has more features though (suggestion for a future Giveaway). For me this is mostly useful for automatic backups of your own files in specific folders (My Documents, wherever your e-mails or photos are stored etc.) where new files are added/updated regularly. The only weak thing is that I'd like to be able to have it keep multiple backups and after let's say 5 copies delete the oldest one. When going through the wizard at the end it offers such an option but curiously enough it states that this can only be used for full disk (partition) backups. Why they would feel the need to impose such a limitation on folder-backups is beyond me. When I read here earlier that DS doesn't use a proprietary backup file format but regular ZIPs my interest grew and I decided to install it. It reminds me of SecondCopy I've used before. That has more features though (suggestion for a future Giveaway). For me this is mostly useful for automatic backups of your own files in specific folders (My Documents, wherever your e-mails or photos are stored etc.) where new files are added/updated regularly. The only weak thing is that I'd like to be able to have it keep multiple backups and after let's say 5 copies delete the oldest one. When going through the wizard at the end it offers such an option but curiously enough it states that this can only be used for full disk (partition) backups. Why they would feel the need to impose such a limitation on folder-backups is beyond me. This program identifies data to be backed up but makes NO claim that it can create a disk image. If a disk drive fails, all software programs must be reinstalled. Programs such as those obtained on this website cannot be installed because of they must be installed on the offer date. I highly recommend a backup program that will create an image of your disk drive and restore it to another disk drive. The image backup will take more time to create but you will be disappointed with anything less. This program identifies data to be backed up but makes NO claim that it can create a disk image. If a disk drive fails, all software programs must be reinstalled. Programs such as those obtained on this website cannot be installed because of they must be installed on the offer date. I highly recommend a backup program that will create an image of your disk drive and restore it to another disk drive. The image backup will take more time to create but you will be disappointed with anything less. @7 Being on Win7 - you really don't need an additional backup software. There is both a really, really good backup built-in to Win7, and you can also use Easy Transfer to different total snapshots of your hdd. ie - install of Win 7 alone, a second one of Win7 after you've installed and activated/registered all your programs - then any additional ones you want. For any others, I personally would never use back-up s/ware obtained here on GOTD. You will have to buy a full functioning copy of the program if you lose it on your drive (crash - new hard drive installed, etc.) - assuming the company is both still in business and still supports the version of backups you have made. 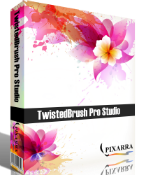 Almost all the other software here ROCKS!! @7 Being on Win7 - you really don't need an additional backup software. There is both a really, really good backup built-in to Win7, and you can also use Easy Transfer to different total snapshots of your hdd. ie - install of Win 7 alone, a second one of Win7 after you've installed and activated/registered all your programs - then any additional ones you want. For any others, I personally would never use back-up s/ware obtained here on GOTD. You will have to buy a full functioning copy of the program if you lose it on your drive (crash - new hard drive installed, etc.) - assuming the company is both still in business and still supports the version of backups you have made. Almost all the other software here ROCKS!! I do my own backups just by copying and pasting to an external drive. Never lost any data in 10 years even when my 2 hard drives crashed. Just re install the operating system and reverse the copy and paste to drive c.
Fast and easy and my data is always available on the USB hard drives, uncompressed and unzipped. I use paragon for system and program restore and no worry whatsoever. I do my own backups just by copying and pasting to an external drive. Never lost any data in 10 years even when my 2 hard drives crashed. Just re install the operating system and reverse the copy and paste to drive c. Fast and easy and my data is always available on the USB hard drives, uncompressed and unzipped. I use paragon for system and program restore and no worry whatsoever. #22: "It is therefore also necessary to have software such as Paragon or Acronis to create a system image in the event of total failure. Those programs will require some recovery procedure (e.g. startup CD, USB etc. ).The disadvantage of those programs (apart from their size and cost!) is their slow speed, their lack of flexibility and the need for proprietary software to recover the image." In actual use the free versions of Acronis you can download from drive manufacturer's sites is actually pretty fast in or outside of Windows if/when you're working with internal hard drives. Paragon Backup will archive ~65GB of files/folders to another internal hard drive in ~1/2 hour. Booting to a USB stick with LiveXP, restoring the backup takes the same amount of time, roughly 1/2 an hour. If your backup archives are on optical disk or an external hard drive connected via USB2, data transfer is of course much slower, but that's not software's fault by any means. RE: Flexibility... IMHO moot point. I can back up a system drive in ~30 min, or I can spend 30 minutes [or more] backing up just what I absolutely need. For small stuff I just use 7zip. #22: <em>"It is therefore also necessary to have software such as Paragon or Acronis to create a system image in the event of total failure. Those programs will require some recovery procedure (e.g. startup CD, USB etc. ).The disadvantage of those programs (apart from their size and cost!) is their slow speed, their lack of flexibility and the need for proprietary software to recover the image. "</em> In actual use the free versions of Acronis you can download from drive manufacturer's sites is actually pretty fast in or outside of Windows if/when you're working with internal hard drives. Paragon Backup will archive ~65GB of files/folders to another internal hard drive in ~1/2 hour. Booting to a USB stick with LiveXP, restoring the backup takes the same amount of time, roughly 1/2 an hour. If your backup archives are on optical disk or an external hard drive connected via USB2, data transfer is of course much slower, but that's not software's fault by any means. RE: Flexibility... IMHO moot point. I can back up a system drive in ~30 min, or I can spend 30 minutes [or more] backing up just what I absolutely need. For small stuff I just use 7zip. #26: " I’ve STILL not found one system I’m comfortable with. To the developer: try making one that allows the user to boot directly from the backup drive. That’s the best way I know to prove the backup works. A good backup program should (IMHO): Backup everything (system files, etc.) you need to start your system. Have the ability to backup one-to-one (copy everything without compression or propriatary files). Have the ability to do incrmental and differential backups..."
RE: one-2-one data copies... when you do data mirroring, everything's written more than one place at once, is immediately available, & in that setup makes good sense. In a backup scenario, one-2-one copies don't make sense because of limited bandwidth plus the way OSes handle transferring data from point A to point B. Something very easy for anyone to verify, copying a bunch of files from one drive to another takes a [sometimes *very*] long time, whether you add compression to ease space requirements or not. Using Paragon or Acronis I can backup a partition roughly 3 times faster than copying individual files, at a minimum, & take up about a 3rd the storage space. RE: Incremental backups... unless you're talking about archiving/syncing something like new emails when/where you've got limited amounts of data, many [most?] savings or efficiencies are a myth. To perform an incremental backup software has to examine data at both point A & point B, compare the 2, then archive any differences. For it to be worth it you need to have a limited amount of data to read/compare, &/or be bandwidth restricted [e.g. on-line backups] -- otherwise you spend more time comparing than if you'd just written a new backup. Disk Image Backups are worse in this regard since data first has to be read, then parsed into individual files to compare. #26: <em>" I’ve STILL not found one system I’m comfortable with. To the developer: try making one that allows the user to boot directly from the backup drive. That’s the best way I know to prove the backup works. A good backup program should (IMHO): Backup everything (system files, etc.) you need to start your system. Have the ability to backup one-to-one (copy everything without compression or propriatary files). Have the ability to do incrmental and differential backups..."</em> FWIW &amp; in case it helps anyone, there are some common I think misconceptions... With a boot loader installed you can boot from another internal drive/partition that has an OS *installed*. There can be only one boot hard drive/partition however -- if this is bad or files critical for booting are lost/damaged, then either that drive has to be repaired/restored/replaced, or it takes an external device, optical drive, or floppy drive etc to provide that critical boot code. Making it more difficult, while those can all be made bootable, the OS itself will often not run as-is, but needs modification to run off other than an internal hard drive as it was designed to do. <em>[BTW, this is one big reason for virtualization's popularity -- one PC/Server goes down, simply run the same virtual machine on another]</em> RE: one-2-one data copies... when you do data mirroring, everything's written more than one place at once, is immediately available, &amp; in that setup makes good sense. In a backup scenario, one-2-one copies don't make sense because of limited bandwidth plus the way OSes handle transferring data from point A to point B. Something very easy for anyone to verify, copying a bunch of files from one drive to another takes a [sometimes *very*] long time, whether you add compression to ease space requirements or not. Using Paragon or Acronis I can backup a partition roughly 3 times faster than copying individual files, at a minimum, &amp; take up about a 3rd the storage space. RE: Incremental backups... unless you're talking about archiving/syncing something like new emails when/where you've got limited amounts of data, many [most?] savings or efficiencies are a myth. To perform an incremental backup software has to examine data at both point A &amp; point B, compare the 2, then archive any differences. For it to be worth it you need to have a limited amount of data to read/compare, &amp;/or be bandwidth restricted [e.g. on-line backups] -- otherwise you spend more time comparing than if you'd just written a new backup. Disk Image Backups are worse in this regard since data first has to be read, then parsed into individual files to compare. Where the heck is the registration key? I tried downloading multiple times & nie reg. key.Its also not in the readme file etc. Where the heck is the registration key? I tried downloading multiple times &amp; nie reg. key.Its also not in the readme file etc. Disk image backups don't bother with defining what bits on your hard drive(s) make up what files -- it just captures all data on your hard drive(s) & makes a copy of it, which is then normally compressed before writing the archive to disk. They take up less room to store on a per file basis, but because they normally include a complete disk/partition worth of data, archives themselves are large. Because they don't store individual files as individual files, disk image backups [like CD/DVD/BD ISO images] need special software to be opened & read. Now, say you wanted a single file off a CD or DVD -- it's far easier & much faster to just copy that file than to mount a disc image (ISO), & copy the file that way, especially since the software to read the image is much slower than accessing the disc directly. That's the weakness of Disk Image Backups -- they're faster & more efficient because they don't bother to read individual files, but should you ever want to, you lose all that speed & efficiency, & then some. So, unless you go with something like data mirroring, where any new data is stored multiple places whenever it's written, File Backups are good for stuff that changes or is created often -- Disk Image Backups are great for all the stuff that doesn't change so much, like Windows & your core apps. In most cases, if you want the best efficiency you'll want to use some combination of both methods. File Backups are Terribly Slow if you're thinking about backing up or restoring an entire drive/partition with lots of individual files, & take more horsepower to compress/decompress -- WinRAR [an app similar to WinZip] is used to benchmark CPUs. Disk Images OTOH are great for archiving, moving, copying, restoring entire disks/partitions, but much less efficient to access if/when you don't want everything. Restoring either kind of backup can be a problem if you want to replace files that are in use, &/or if/when Windows won't run etc. It can happen much faster booting to a fuller Windows/*nix environ rather than the minimal DOS-like rescue disks many apps provide -- the sole exception I've seen is Acronis. It's my opinion that you should actually try a backup restore -- preferably on an older or spare PC/laptop for obvious reasons -- *Before* you settle on an app or apps as part of your backup strategy... thinking you have it nailed down based solely on marketing can [particularly in some situations] be disastrous. Just the fact that you burned some ISO to disc *is not cause for any confidence*. And if/when up-time/availability is critical, stop thinking of just backups & start thinking about redundancy. Double Safety can be a viable, easy to use part of most users backup strategy. There's nothing complicated about it at all, you can use it's own scheduler, the one Windows has built-in, your choice of any other scheduler, or none at all -- just run it manually. Like all File based backup solutions [including things like just using 7zip to archive a few files], it's ideal when/if you might want/need whatever it is you backed up in a hurry, don't want to take up a lot of archive space for just a relative few files, &amp;/or don't want bog down a network connection with much more data than needed. File backup itself is great when you have small amounts of data that change often, whether it's e-mails or pictures or projects or invoices. For complete backups, not so much... Disk image backups don't bother with defining what bits on your hard drive(s) make up what files -- it just captures all data on your hard drive(s) &amp; makes a copy of it, which is then normally compressed before writing the archive to disk. They take up less room to store on a per file basis, but because they normally include a complete disk/partition worth of data, archives themselves are large. Because they don't store individual files as individual files, disk image backups [like CD/DVD/BD ISO images] need special software to be opened &amp; read. Now, say you wanted a single file off a CD or DVD -- it's far easier &amp; much faster to just copy that file than to mount a disc image (ISO), &amp; copy the file that way, especially since the software to read the image is much slower than accessing the disc directly. That's the weakness of Disk Image Backups -- they're faster &amp; more efficient because they don't bother to read individual files, but should you ever want to, you lose all that speed &amp; efficiency, &amp; then some. So, unless you go with something like data mirroring, where any new data is stored multiple places whenever it's written, File Backups are good for stuff that changes or is created often -- Disk Image Backups are great for all the stuff that doesn't change so much, like Windows &amp; your core apps. In most cases, if you want the best efficiency you'll want to use some combination of both methods. File Backups are Terribly Slow if you're thinking about backing up or restoring an entire drive/partition with lots of individual files, &amp; take more horsepower to compress/decompress -- WinRAR [an app similar to WinZip] is used to benchmark CPUs. Disk Images OTOH are great for archiving, moving, copying, restoring entire disks/partitions, but much less efficient to access if/when you don't want everything. Restoring either kind of backup can be a problem if you want to replace files that are in use, &amp;/or if/when Windows won't run etc. It can happen much faster booting to a fuller Windows/*nix environ rather than the minimal DOS-like rescue disks many apps provide -- the sole exception I've seen is Acronis. It's my opinion that you should actually try a backup restore -- <em>preferably on an older or spare PC/laptop for obvious reasons</em> -- *Before* you settle on an app or apps as part of your backup strategy... thinking you have it nailed down based solely on marketing can [particularly in some situations] be disastrous. Just the fact that you burned some ISO to disc *is not cause for any confidence*. And if/when up-time/availability is critical, stop thinking of just backups &amp; start thinking about redundancy. This is a good package, but I agree with #4 and several others that GFI Backup, FBackup, Cobian Backup, Paragon and several other freeware backup programs provide at least the same functionality without cost or license issues. I also agree that backup files up to the same HD is entirely sensible when the object is to have a "good" copy available in case you screw up the copy you are working on, such as of a complex spreadsheet or database. The object isn't to restore from a HD failure (for which you need a complete system backup) but to recover from a user error or power glitch. Finally, developers should be using versioning software, of which there are several good freeware examples. This applies to software developers, authors, and artists. This is a good package, but I agree with #4 and several others that GFI Backup, FBackup, Cobian Backup, Paragon and several other freeware backup programs provide at least the same functionality without cost or license issues. I also agree that backup files up to the same HD is entirely sensible when the object is to have a "good" copy available in case you screw up the copy you are working on, such as of a complex spreadsheet or database. The object isn't to restore from a HD failure (for which you need a complete system backup) but to recover from a user error or power glitch. Finally, developers should be using versioning software, of which there are several good freeware examples. This applies to software developers, authors, and artists. I just wanted to say about backup software: I use syncback and I have been impressed every day since I first got it. Great syncing/backup capabilities, totally free, can even do syncing over ftp or over the network. Small program, no bloat, and very quick at what it does. #8. When using "backup to hard drive", one uses a different HD from the one being backed up. Yes, some people have more than one hard drive. I have just installed Noscript upon your advice and restarted Firefox. You are correct and deserve a YES which I tried to give you. It never happened - INSTEAD the whole screen blanked out. I had to return to the email notification and re-click the link to come back. You are WRONG and deserve a NO, but NoScript blocked that also. There are 6 Tabs of options with 56 box/circle options on the first 5. The last TAB has a gazillion subsidiary TABS. Life is too short for all this aggravation. I only came to have a quick look at today's special offer. I am not prepared to waste a few hours spread over several days/weeks consulting FAQs and Noscript User forums etc. to learn how to eliminate this Sticker aggravation but retain other functionality. I will now see if "Submit Comment" is also blocked - after a "select All" and Copy to paste buffer ready for yet another browser meltdown. @17 I have just installed Noscript upon your advice and restarted Firefox. You are correct and deserve a YES which I tried to give you. It never happened - INSTEAD the whole screen blanked out. I had to return to the email notification and re-click the link to come back. You are WRONG and deserve a NO, but NoScript blocked that also. NoScript has options, so many options TOO MANY OPTIONS There are 6 Tabs of options with 56 box/circle options on the first 5. The last TAB has a gazillion subsidiary TABS. Life is too short for all this aggravation. I only came to have a quick look at today's special offer. I am not prepared to waste a few hours spread over several days/weeks consulting FAQs and Noscript User forums etc. to learn how to eliminate this Sticker aggravation but retain other functionality. I will now see if "Submit Comment" is also blocked - after a "select All" and Copy to paste buffer ready for yet another browser meltdown. #8: "you can store backups on your hard drive... Which would be a spectacularly stupid thing to do... If your hard drive dies, your backup goes with it." Not everyone has the cash to go out & buy an external [or additional internal] hard drive -- & those that do have an external drive, don't always have the patience to wait for the backup data transfer over USB2. If you've got a business where your data is irreplaceable, backups should be stored securely somewhere else in case of fire, break-ins etc, but for the average home user, just setting up centralized network storage is very often overkill. Backing up Windows & your data, pictures etc to your only hard drive is clearly better than nothing at all -- I've seen a couple of absolute hard drive failures over the last couple decades [most of the time I've had warning], but had to restore backups due to Windows or software screwing up a couple times a year on average with the few PCs/laptops here. A quick tip... If/when you upgrade hardware, save & use the old hard drives. Every so often Thermaltake for example has external hard drive cases [sometimes reman] for as little as ~$20 shipped. [You can find them cheaper (I got 1 for $10), but flip a coin on whether they'll work or not] Or you can stick an old drive in your PC just for backups -- even if it's an old IDE drive, you can buy IDE SATA adapters for a few dollars. #8: <em>"you can store backups on your hard drive... Which would be a spectacularly stupid thing to do... If your hard drive dies, your backup goes with it. "</em> Relax... :-) Not everyone has the cash to go out &amp; buy an external [or additional internal] hard drive -- &amp; those that do have an external drive, don't always have the patience to wait for the backup data transfer over USB2. If you've got a business where your data is irreplaceable, backups should be stored securely somewhere else in case of fire, break-ins etc, but for the average home user, just setting up centralized network storage is very often overkill. Backing up Windows &amp; your data, pictures etc to your only hard drive is clearly better than nothing at all -- I've seen a couple of absolute hard drive failures over the last couple decades [most of the time I've had warning], but had to restore backups due to Windows or software screwing up a couple times a year on average with the few PCs/laptops here. A quick tip... If/when you upgrade hardware, save &amp; use the old hard drives. Every so often Thermaltake for example has external hard drive cases [sometimes reman] for as little as ~$20 shipped. [You can find them cheaper (I got 1 for $10), but flip a coin on whether they'll work or not] Or you can stick an old drive in your PC just for backups -- even if it's an old IDE drive, you can buy IDE SATA adapters for a few dollars. To those reviewers suggesting that backing up to the same computer is "spectacularly stupid", "daft", etc., please try to understand the life of a software developer. We write, and we write, and we write, and then we re-write, and we tweak, and we re-write, and we modify, and we re-write (ad nauseum...) our multiple, interlaced programs all day long. Therefore, we appreciate a backup program like this that we can run first thing in the morning and at various other times of the day to save WORKING in-progress versions of our programming labours. Then if we start going in the wrong direction with our coding endeavours, we just grab the last good copy from our backups and compare/start over/swear/cut & paste/combine/etc. If we put those backups on a disk or remote location, it becomes a pain in the peripheral to restore things. Don't get me wrong... we do make off-site backups as well, but that's a whole different matter as to what gets backed up, how it gets backed up, and where that all gets stored. To those reviewers suggesting that backing up to the same computer is "spectacularly stupid", "daft", etc., please try to understand the life of a software developer. We write, and we write, and we write, and then we re-write, and we tweak, and we re-write, and we modify, and we re-write (ad nauseum...) our multiple, interlaced programs all day long. Therefore, we appreciate a backup program like this that we can run first thing in the morning and at various other times of the day to save WORKING in-progress versions of our programming labours. Then if we start going in the wrong direction with our coding endeavours, we just grab the last good copy from our backups and compare/start over/swear/cut &amp; paste/combine/etc. If we put those backups on a disk or remote location, it becomes a pain in the peripheral to restore things. Don't get me wrong... we do make off-site backups as well, but that's a whole different matter as to what gets backed up, how it gets backed up, and where that all gets stored. I saw the program uses the standard ZIP compression format (or none) when backing up. It also offers the choice of using Volume Shadow Copy to backup files in use. A keeper for this reason alone. Perfect! I was looking for something like this (too lazy to program it myself) it worked fine to install &amp; register on Win7x64 Thanx! If you lose your harddrive, having to pay a fee to restore it would be worth it. @15 If you lose your harddrive, having to pay a fee to restore it would be worth it. @ 10This is a backup program, dsigned to backup your data. It is not, nor does it claim to be, a disaster recovery app. Backup everything (system files, etc.) you need to start your system. Have the ability to backup one-to-one (copy everything without compression or propriatary files). Have the ability to do incrmental and differential backups. Back up files while the machine is in use. #6 and #16 - I see them too and they truly annoy me also (I use IE). I understand why they're there, just don't like 'em. Not going to try this backup. I've STILL not found one system I'm comfortable with. To the developer: try making one that allows the user to boot directly from the backup drive. That's the best way I know to prove the backup works. A good backup program should (IMHO): Backup everything (system files, etc.) you need to start your system. Have the ability to backup one-to-one (copy everything without compression or propriatary files). Have the ability to do incrmental and differential backups. Back up files while the machine is in use. Tried this when it was offered on August 4, 2009 (version 4.4). Worked well, and would create a zip file of the information I was backing up. Quite easy to use, and offers (offered) password protection to the backup. Thus, to restore, you didn't need the software, just needed to unzip to where I wanted to restore. My test was on the Firefox and Thunderbird data store folders (not small on my system, +/-1GB). The backup went well, the restore as well. If this version works like the previous version, this would be a good, and simple, backup utility for someone not needing a backup application with tons a (useless) features. Simply create a backup 'profile' (what you want to backup, and to where, etc). Then start it when you need/want to backup. The same *could* be done with simple freeware command line tools and a batch file, however, that would require a good understanding of batch writing and your folder structure. Tried this when it was offered on August 4, 2009 (version 4.4). Worked well, and would create a zip file of the information I was backing up. Quite easy to use, and offers (offered) password protection to the backup. Thus, to restore, you didn't need the software, just needed to unzip to where I wanted to restore. My test was on the Firefox and Thunderbird data store folders (not small on my system, +/-1GB). The backup went well, the restore as well. If this version works like the previous version, this would be a good, and simple, backup utility for someone not needing a backup application with tons a (useless) features. Simply create a backup 'profile' (what you want to backup, and to where, etc). Then start it when you need/want to backup. The same *could* be done with simple freeware command line tools and a batch file, however, that would require a good understanding of batch writing and your folder structure. #8 Guiseppe "you can store backups on your hard drive"
Not having a backup in another place (DVD, Web, another HDD ...whatever) is less than sensible, for as you rightly say you lose that drive you lose everything - not all problems arise from hardware failure. Some use one copy for both, some dont. #8 Guiseppe "you can store backups on your hard drive" Not a spectacularly stupid thing at all. Often (mainly?) you want to recover data because it has been corrupted (person/program) or lost/deleted or inadvertently updated - saved to existing file by mistake ...to name but a few situations. Backups to the same hard drive will work. Backing up to the same local drive is quick and easy Not having a backup in another place (DVD, Web, another HDD ...whatever) is less than sensible, for as you rightly say you lose that drive you lose everything - not all problems arise from hardware failure. Some use one copy for both, some dont. Which would be a spectacularly stupid thing to do, although many people do just that. You don’t store the backup the same place as what you’re backing up. If your hard drive dies, your backup goes with it. This is a neat little program. As noted above, it installed and activated smoothly on XPsp2 is intuitive with a low learning curve. It has many features which I will find useful. Important to note is that this is NOT system recovery software. It does not create an image of your hard drive, but will simply copy the files you specify conveniently and quickly to a destination of your choice. (I have not attempted to backup to an FTP server, but this may be useful for some people, if it works). It is therefore also necessary to have software such as Paragon or Acronis to create a system image in the event of total failure. Those programs will require some recovery procedure (e.g. startup CD, USB etc. ).The disadvantage of those programs (apart from their size and cost!) is their slow speed, their lack of flexibility and the need for proprietary software to recover the image. DoubleSafety is small, extremely fast and flexible and can be used for day-to-day work, keeping your work and (most) installed program files secure in between major system backups. There are many programs which do this (see above, plus Cobian Backup, Windows Backup), however this one does have some neat features and is very easy to use. it produces .zip files which can be read by Windows, so no software is needed to recover your data. the compression level is variable and files which do not compress easily (.jpg,.pdf etc.) can be included in the archive but exempted from compression thereby improving speed and reducing overhead. Multiple types of backup can be created (full, incremental, differential etc., various sources/destinations /frequency/features) all kept separate and always editable. It can encrypt for security, can activate missed jobs and send notifications of failure/completion. Good little package. Two more important things to note: 1. DoubleSafety can backup registry keys - however some registry keys cannot be restored directly to the registry while Windows is running. It will be useful for keys where user data is stored, such as program settings and keys. 2. Instead of using Windows scheduler, DoubleSafety uses it own scheduler, which means that it attempts to start with Windows and runs in the background. This may slow Windows startup time and also chews up some 18Mb of RAM. It may be a workaround to use Windows scheduler to start DoubleSafety regularly instead. Hope this helps. I will work with it. This is a neat little program. As noted above, it installed and activated smoothly on XPsp2 is intuitive with a low learning curve. It has many features which I will find useful. Important to note is that this is NOT system recovery software. It does not create an image of your hard drive, but will simply copy the files you specify conveniently and quickly to a destination of your choice. (I have not attempted to backup to an FTP server, but this may be useful for some people, if it works). It is therefore also necessary to have software such as Paragon or Acronis to create a system image in the event of total failure. Those programs will require some recovery procedure (e.g. startup CD, USB etc. ).The disadvantage of those programs (apart from their size and cost!) is their slow speed, their lack of flexibility and the need for proprietary software to recover the image. DoubleSafety is small, extremely fast and flexible and can be used for day-to-day work, keeping your work and (most) installed program files secure in between major system backups. There are many programs which do this (see above, plus Cobian Backup, Windows Backup), however this one does have some neat features and is very easy to use. it produces .zip files which can be read by Windows, so no software is needed to recover your data. the compression level is variable and files which do not compress easily (.jpg,.pdf etc.) can be included in the archive but exempted from compression thereby improving speed and reducing overhead. Multiple types of backup can be created (full, incremental, differential etc., various sources/destinations /frequency/features) all kept separate and always editable. It can encrypt for security, can activate missed jobs and send notifications of failure/completion. Good little package. Two more important things to note: 1. DoubleSafety can backup registry keys - however some registry keys cannot be restored directly to the registry while Windows is running. It will be useful for keys where user data is stored, such as program settings and keys. 2. Instead of using Windows scheduler, DoubleSafety uses it own scheduler, which means that it attempts to start with Windows and runs in the background. This may slow Windows startup time and also chews up some 18Mb of RAM. It may be a workaround to use Windows scheduler to start DoubleSafety regularly instead. Hope this helps. I will work with it. To me, core software (software you rely on in critical situations) like your backup software, must elicit the full confidence of the user. One look at the simplistic developer's web site with no technical information or detailed feature commentary only serves to deter me from exploring this further. As noted above there seems to be a serious lack of a stand-alone recovery media. I install the software and installation went fine; the activation too easy as always I manage to install it in 3 PCs, the software does what it says but I will like to see support to backup from outlook and others email clients. For comment #14, this is why GAOTD let you try the software for free and if it's working for you to buy it later, how do you expect the software developer to make money if they make the software available for free all the time. works good on win7 x32. easy to use. quick. #14,#10: the restore can be done with ANY ZIP compatible software. #12: the proprietary file format is ZIP. works good on win7 x32. easy to use. quick. #14,#10: the restore can be done with ANY ZIP compatible software. #12: the proprietary file format is ZIP. #8: backup can be stored just about anywhere. local HD, CD or DVD works for me. keeper. thanks GAOTD! #6- You need Firefox with Adblock Plus and NoScript installed as add-ons. Nice program today. Recommended. To #6 What are you talking about? Never seen a pop up. You need to sort out your browser before you move on to other things. Some interesting comments. I'd normally put a program like this onto an external HD. Is that not possible with this offering? If any backup or disc image is dependent upon the creating program not also needing restored, then it is useless. To #6 What are you talking about? Never seen a pop up. You need to sort out your browser before you move on to other things. Some interesting comments. I'd normally put a program like this onto an external HD. Is that not possible with this offering? If any backup or disc image is dependent upon the creating program not also needing restored, then it is useless. I don’t look at thumbs up or down – it is a useless indication. I would rather get the feedback comments the user has given on a specific program. and install problems. The software installed fine and activated no probs, The interface is intuative and is easy to use. it does what it claims. I don’t look at thumbs up or down – it is a useless indication. I would rather get the feedback comments the user has given on a specific program. and install problems. The software installed fine and activated no probs, The interface is intuative and is easy to use. it does what it claims. From the comments, I gather it creates a proprietary file format? I had Insofta Document Backup from a previous giveaway but lost it when I upgraded to Win 7. It created standard zip files. I would like to see that one come around again. I am not sure I see the point of this software, as there are many backup apps available, some free of charge. Recent versions of Windows have them also. - how restorations work (everything on HDD or individual files). As was pointed out above, backing up to HHD on same computer -- even if on different partition -- is daft. Ideally the backup should be to a remote server, which can be done online these days. Does the backup reflect what is on the HDD (with file content and name changes) or is it just a file-copying app? Does it permit restoration of older versions of files? There's "backup" and there's real backup. I am not sure I see the point of this software, as there are many backup apps available, some free of charge. Recent versions of Windows have them also. Furthermore, there is no indication of - how it works (HDD snapshots or individual files) and, more importantly, - how restorations work (everything on HDD or individual files). As was pointed out above, backing up to HHD on same computer -- even if on different partition -- is daft. Ideally the backup should be to a remote server, which can be done online these days. Does the backup reflect what is on the HDD (with file content and name changes) or is it just a file-copying app? Does it permit restoration of older versions of files? Etc etc There's "backup" and there's real backup. All I get when I try to activate it is Fatal Error. I have installed it without problems on 2 other personal computers. All I get when I try to activate it is Fatal Error. I have installed it without problems on 2 other personal computers. In case of a hard drive failure the most efficient way to restore a backup is by having a 'rescue' type bootable medium (CD or USB-stick) which is capable of restoring the backups to the new HD. Without such a facility you'd have to go through the whole installation process of your OS on your new HD AND be able to re-install the backup software before you can restore your backups. With the GOTD version you won't be able to do that. If you're lucky you can use a trial version to restore your backup if it allows such full functionality. Otherwise you'll be forced to buy the software to restore your backup. I haven't found any reference in the software's specs that it has an option to create such a 'rescue' medium which for instance the different Paragon apps that have backup functionality always do have. In case of a hard drive failure the most efficient way to restore a backup is by having a 'rescue' type bootable medium (CD or USB-stick) which is capable of restoring the backups to the new HD. Without such a facility you'd have to go through the whole installation process of your OS on your new HD AND be able to re-install the backup software before you can restore your backups. With the GOTD version you won't be able to do that. If you're lucky you can use a trial version to restore your backup if it allows such full functionality. Otherwise you'll be forced to buy the software to restore your backup. I haven't found any reference in the software's specs that it has an option to create such a 'rescue' medium which for instance the different Paragon apps that have backup functionality always do have. A major shortcoming IMHO. Install and activated successfully. The backup program is consider user friendly and stable, it's simple and easy to use too. It even can backup the Windows Registry, so overall is cool backup program. Sadly, it lack of one function that I need, which is backing up small stuff into an email account. Install and activated successfully. The backup program is consider user friendly and stable, it's simple and easy to use too. It even can backup the Windows Registry, so overall is cool backup program. Sadly, it lack of one function that I need, which is backing up small stuff into an email account. Which would be a spectacularly stupid thing to do, although many people do just that. You don't store the backup the same place as what you're backing up. If your hard drive dies, your backup goes with it. <i>you can store backups on your hard drive</i> Which would be a spectacularly stupid thing to do, although many people do just that. You don't store the backup the same place as what you're backing up. If your hard drive dies, your backup goes with it. Windows Registry backup feature is now supported by our software. 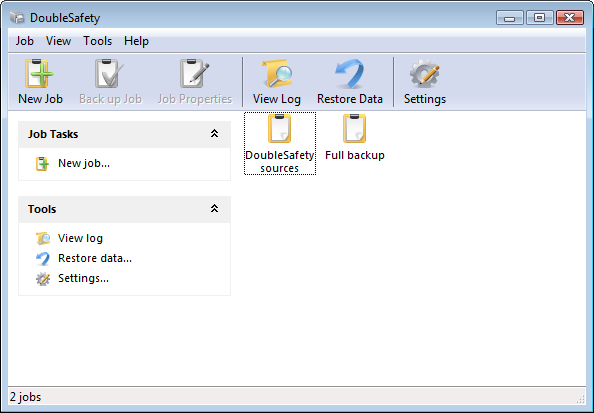 From their website: DoubleSafety 4.5 released Windows Registry backup feature is now supported by our software. July 21, 2010 Back to the future!